One of the biggest advantages of a bike, especially in the towns, is the opportunity to filter through traffic. 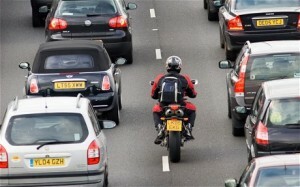 Filtering through traffic is legal if carried out in a slow and safe manner. If done incorrectly or at too fast a speed it can be very dangerous. The law states that you should only go at a speed so that you are in control of bike and can stop in an emergency. Filtering in traffic at speeds above 15-20 mph should be avoided, as vehicles at this speed can change direction without warning. Also you shouldn’t be travelling more than 10-15 mph above that of the slow moving traffic. Good machine control is essential to safe filtering and your concentration needs to be focused mainly on the traffic in the near and middle distance. Do you have an escape route planned? Have you allowed sufficient distance from other traffic to enable you to react? Could a pedestrian step out? What are the drivers thinking, can they see you? Check the mirrors, can you see the driver?